Hilltop Hideaways is the Perfect Escape. Welcome to your perfect escape. Enjoy a family glamping holiday in the best of the beautiful Warwickshire countryside from the luxury of our family friendly campsite. Hilltop Hideaways is nestled into the rolling Warwickshire hills on a third generation family farm. We’re just a few miles from Royal Leamington Spa, with Warwick, Stratford-upon-Avon and have the magical Cotswolds right on our doorstep too. Our child friendly campsite is family-run. We offer a choice of either wooden cabins, bell tents or shepherds huts for you to stay in – all of which sleep up to four people. There is a children’s play area with swings and a slide, ride on tractors for little ones and plenty of space to run around in and make the most of the outdoors. There’s no need to bring food with you as we have a well-stocked farm shop with local produce and essentials, including a bakery and butchery. In addition our cafe is open from 9am daily for our award winning breakfasts, lunches and afternoon teas all prepared with locally sourced seasonal produce, and we are open on Friday evenings during the summer months. 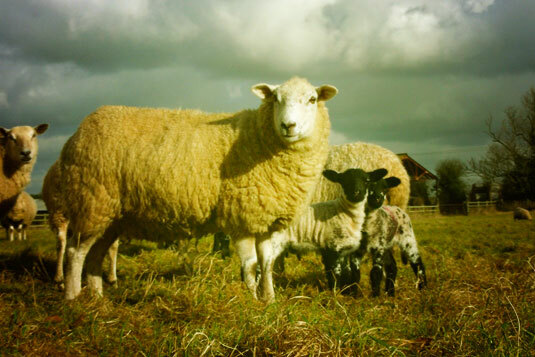 During the year we run a number of family friendly events usually with live music ranging from our annual ‘Beer & Cider Festival’ to ‘Meet the Lambs’ at Easter. If you fancy a bit of a walk you can venture into the village of Hunningham on our farm trail, which handily has the local pub at the end of it! So there is much to see and do for all ages during your family glamping holiday at Hilltop Hideaways. Our campsite offers a choice of either wooden cabins, luxury bell tents or beautiful shepherds huts. All have double beds with feather down duvets and camp beds for children in the bells and cabins. The shepherds huts have the choice of a double sofa bed or bunk beds. 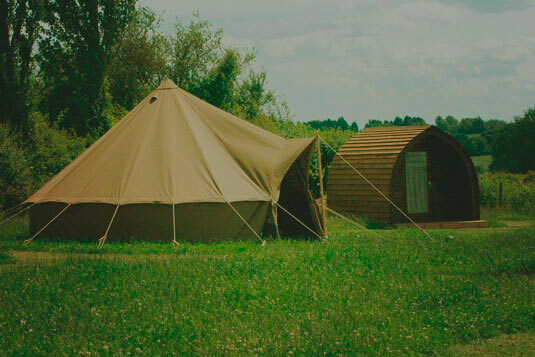 Glamping has arrived in Warwickshire at Hilltop! Thank you for making our stay both fun and comfortable - a good night's sleep (in real beds!) with essential home comforts combined with wonderful views and great food meant a good time was had by all. Thanks to you all at Hilltop Hideaways for making my birthday stay so special and memorable. We will be back! Huge thanks to Hilltop Hideaways and to everyone at the farm shop and café – a real haven. First class glamping. Great location and great facilities and so much to enjoy and do. Everyone was so welcoming, we could have stayed forever! Amazing location – the views are incredible - best sunset I have ever seen!